The market cap of most cable companies has soared thanks to the digital access system and a transparent revenue model. But their challenges are not over. Jagdish Kumar had spent most of his career in the broadcast and new media businesses. But, about a year ago, he made a major switch and took over as Managing Director and CEO of Hathway Cable & Datacom. He says he would never have moved to the cable industry had it not been for the rolling out of the digital access system in November last year. 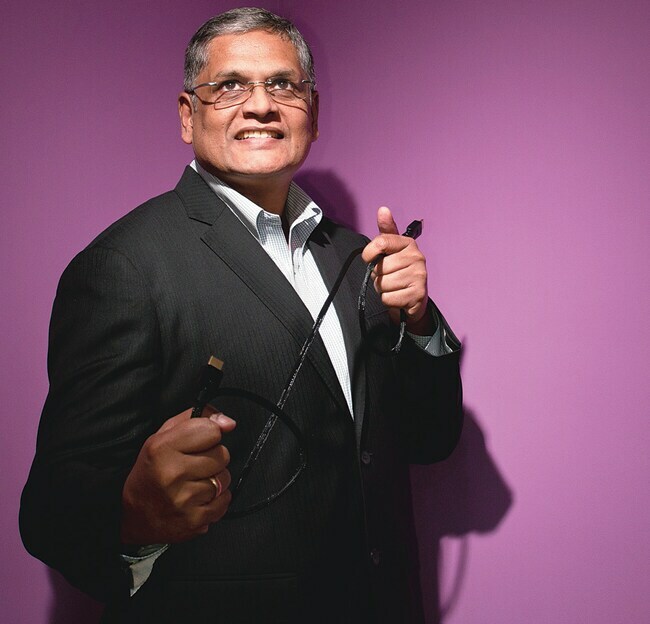 "November 1, 2012, was a game changer for the Rs 20,000-crore cable industry and I realised that I could be part of a future-led transformation industry," he says. Like him, barely a year ago, many media professionals would probably not have touched the cable business with a bargepole. Plagued by large-scale under-declaration of revenue by cable operators, it lacked transparency and clear-cut revenue models. Not anymore. The digitisation of cable has professionalised the business, and multi-service operators (MSOs) such as Hathway or Siti Cable are no longer at the mercy of local cable operators. Investors are making a beeline for cable companies such as Hathway, DEN Networks and Siti Cable, which have seen a sharp increase in their market caps and revenues. DEN Networks's market cap has grown nearly 80 per cent in the past year, while Hathway and Siti Cable have witnessed over 40 per cent growth. Industry revenues are up more than 50 per cent and are likely to jump to Rs 32,340 crore in 2014 from Rs 4,032 crore, according to Chrome Data Analytics. Average revenue per user is expected to increase to Rs 550 from about Rs 140 in the analog era. Though digitisation is still being rolled out, cable companies have become an attractive investment destination. Last year, Macquarie Bank and US-based private equity fund Providence Equity Advisors bought out Star India's 17 per cent stake in Hathway for Rs 358 crore. In July, the fund invested another Rs 110 crore for an additional 3.55 per cent stake in the company. Goldman Sachs recently picked up an 18 per cent stake in DEN Networks for Rs 693 crore. And Zee Group's Siti Cable got the government nod to raise Rs 324 crore from its promoter companies. "Post-digitisation, cable has come up better than direct-to-home (DTH) in most countries, and investors are already thinking forward," says Ashish Tripathi, Associate Director, Transaction Advisory Services, Ernst & Young. "There isn't a market where DTH has done well, where cable was an incumbent, except in countries such as Australia where the population density is low." So, what does the cable industry offer? Does it have an edge over the DTH industry, which has nearly 45 million subscribers and over the years has been clinching clients from cable? Quite simply, the main attraction is economic. To begin with, an entry-level digitised cable set-top box is priced at Rs 800, while an entry level DTH box is much higher at about Rs 2,000 to Rs 2,250. The average monthly pay-out for a cable subscriber is between Rs 250 and Rs 300, while a DTH subscriber pays close to Rs 400. Moreover, digitised cable can offer over 1,000 channels, while DTH can, at the most, offer 300 channels. Also, the game changer for the cable companies could be broadband, which DTH doesn't have the capability to offer. "This country is hungry for Internet services and if that is capitalised, cable can have a transformational impact on the society," says Atul Phadnis, CEO of TV programming and search guide company What's On India. The cable industry has tremendous growth opportunities, but it won't be a cakewalk. It has been a B2B industry for about two decades and cable companies have started dealing directly with consumers only after digitisation. Are they equipped for it? "We never bothered about consumers and there was not even a desire to understand the consumers. However, we are slowly adapting to the changes of digitisation and learning to be a consumer-facing company," says V.D. Wadhwa, CEO of Zee Group-owned cable company Siti Cable. In the first phase of digitisation, most cable companies pushed their set-top boxes into consumers' homes, but the companies did not know their viewing habits. Multiple channels were sold for a flat price of Rs 200 until authorities made it mandatory for cable companies to conduct a process to know their consumers. Since then, the operators have started offering packages with a base pack of free-to-air channels at Rs 100 and a pack of a few popular pay channels for between Rs 160 and Rs 180. But cable companies are betting on premium packages priced anywhere between Rs 265 and Rs 365. "We expect a large chunk of our revenue to come from premium packages and HD," says Wadhwa of Siti Cable. The full subscription potential of digitsation has still to be realised. "There are many stakeholders in this chain. There has to be a sync in this chain as finally it is the consumer who will pay for the product. Currently, there is a huge gap in the value chain which needs to be addressed," says Pankaj Krishna, CEO, Chrome Data Analytics & Media. In order to cater to billing for multiple packages, cable companies are investing heavily in back-end technology. Wadhwa says Siti Cable has pumped in close to Rs 1,000 crore to set up its back-end system. "There is no point focusing on expansion of subscribers unless we have the technology in place," he says. Analysts are worried about the slow pace at which cable companies are offering broadband and other value-added services, which could give them a clear edge over DTH. "We are far away from it," says Hathway's Kumar. "But the goal is to ensure that almost 40 per cent of our revenues come from broadband and value-added services four years from now." Cable companies are not the biggest fans of local cable operators. The monopoly of operators deprived these companies as well as broadcasters of a considerable chunk of revenue for over two decades. However, service operators have realised they cannot do without cable operators and are investing heavily to empower them. Siti Cable, for instance, is training more than 4,000 cable operators on maintaining subscriber data, finding out details about packages and tracking billing cycles. "The MSOs require the LCOs (local cable operators) as they are the face for the consumers and convince them to go for the MSOs set-top box," says Mihir Shah, Vice-President, Media Partners Asia. Wadhwa agrees that the role of local cable operators is important. "The LCO can even activate and deactivate the signal if a particular consumer hasn't paid on the due date. The idea is to treat LCOs like partners," he says. 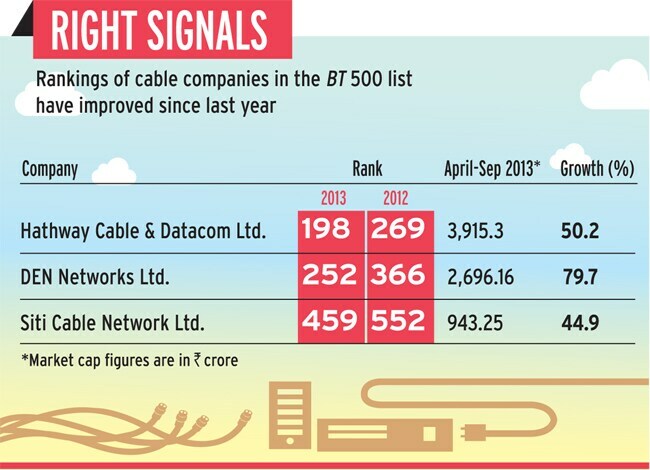 Despite the change, local cable operators are yet to reconcile to losing their monopoly. Their profitability in the last one year has dipped 50 per cent and many are looking at alternative career options or selling out to service operators. "Digitisation has led to a lot of confusion," says the spokesperson of CTV, one of the largest cable operators in South Mumbai. "We are losing at least 30 subscribers a month to DTH due to non-availability of some services." He isn't alone. John David, Vice-President, Malvani Cable Operators Association, which caters to Malad in the western suburbs of Mumbai, says he too has lost around 200-300 customers in the past three months due to a shortage of boxes. "The LCOs are insecure as their job now has got delegated to collecting money from consumers and passing it on to the MSOs," says Chrome's Krishna. So, will local cable operators eventually shut shop? No, says Krishna. "The MSOs need the LCOs. Smart LCOs will become marketing agents and will try to open up additional sources of revenue by generating local advertising. Some of the smarter ones may even start offering broadband and share the revenue with the MSO." The long-term vision of cable companies is not only to kill DTH but also to compete with telecom companies. They cannot afford to go slow in overcoming the challenges, says Phadnis of What's On India. "They also need to invest in brand-building. DTH may catch cable companies sleeping if they don't create national brands."